It may not be officially winter but the cold weather with it’s freezing blasts has certainly arrived. After the long stretch of above average temperatures it is certainly a shock to the system to be dealing with below freezing days and super cold nights. How do alpacas deal with winter? In my experience they handle winters in Kansas pretty well although big changes in weather are more difficult for them than a gradual cooling. This human does not like that either! Shelter of some kind is a must so that they can get out of the wind and snow or rain. We have wooden floors in our field shelters so that it is easier for the alpacas to stay dry. Now that there is no grass to speak of, the alpacas need plenty of hay. 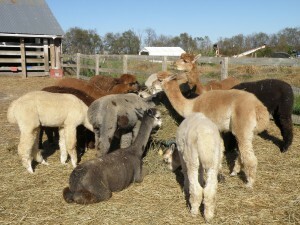 We feed alpaca pellets once or twice a day depending on the condition of the individual animals. For our females we have a ‘skinny’ barn where the thinner animals can have extra if they need it. We have found that for older animals or those who seem to be losing condition, sugar beet pulp with some alfalfa pellets works really well. We choose to soak the beet pulp although many people feed it dry. All our alpacas will happily eat soaked beet pulp. It is particularly important to keep a watch on the older animals whose fleece will have a shorter staple length and offer less protection from the cold. They may need to be coated. Another vital consideration in the winter is an unfrozen source of water. Heated water buckets or trough heaters are a must. Automatic waterers are very useful. It is important in cold weather to monitor the animals’ water intake to make sure they stay hydrated.